Event Date : 16 - 17 November 2017. 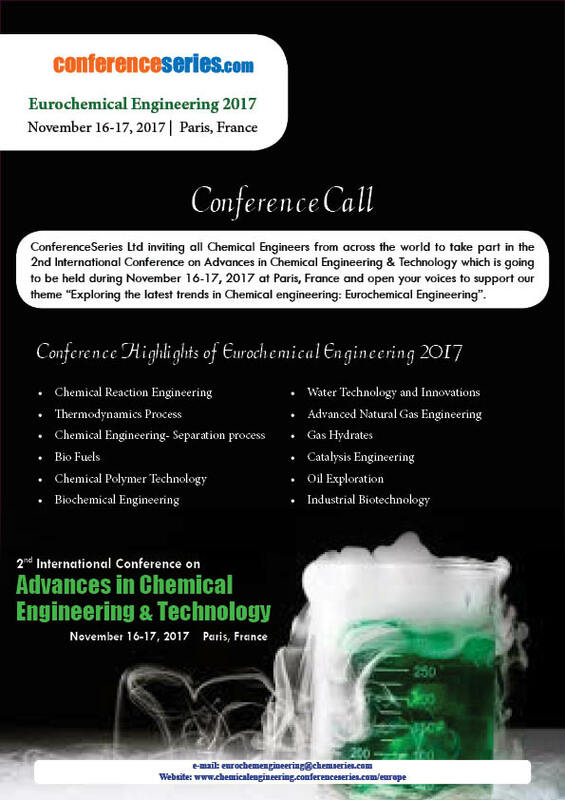 By following the successful campaign of "Chemical Engineering-2016" Conference Series LLC is very delighted to Organize the 2nd International Conference on Advances in Chemical Engineering and technology during November 16-17, 2017 Paris, France which includes prompt keynote presentations, Oral talks, Poster presentations and Exhibitions. On this propitious moment, we invite all the global participants to join us at Paris, France for "Eurochemical Engineering 2017". Theme of the Chemical engineering 2017 conference is "Exploring the latest trends in Chemical Engineering" with an objective to encourage young minds and their research abilities by providing an opportunity to meet the experts in the field of Chemical Engineering. Chemical Engineering events are designed to explore various applications in different fields.